A company called TrueSwords created this amazing replica of a Covenant energy sword from Halo 3. I find this picture absolutely mesmerizing. Look at how the reflects in so many different colors, the sleek curves, the alien, yet familiar feel. It's truly amazing. 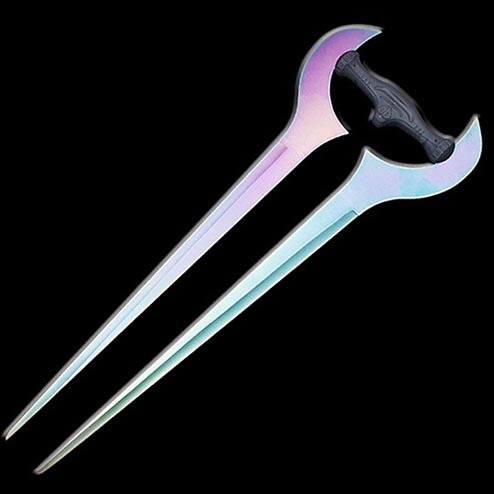 Conceptually, I also like how this design — as beautiful as it is — completely fails as a weapon: It's unwieldy, it's difficult to keep straight, parrying might lead to cut fingers, etc. And I believe it's exactly this failure as a weapon that makes it even more beautiful.